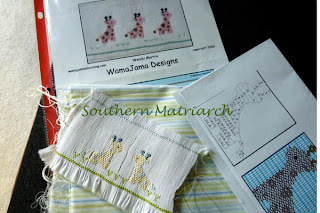 Southern Matriarch: Life is a zoo! No, really it is just Baby Giraffes. I was telling a friend that I wasn't sure about this insert. I was concerned that the colors were too muted. So I took a picture of it. The colors are more muted than I would like but I think I am going to go with it, not changing it now. 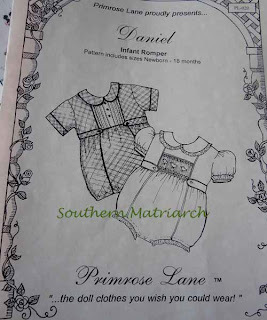 I am using Primrose Lane "Daniel" for a bubble. I have to take a break first and insert a zipper into a dress youngest daughter is making, then pleat some inserts for #2 daughter and last finish another quilt block dress. I have a few days to get this constructed, the baby shower isn't until Friday. TIP: At first I was going to do the plate as shown except do only two giraffes because this bubble has a more narrow insert than many. I had an "ah ha" moment yesterday. (I Know they are few and far between.) I had the thought that I should just turn one of them around so they face each other. Originally I was going to try and wing the graph by "reading" it backwards. Thank heaven I know my limitations. So finally it dawns on me to scan it and flip the image. Worked like a charm. That is what the graph on the right hand side of the picture is. Now I will say it will mess with your brain to look at the graph and see all of the other text backwards. Since I wasn't going to use the text directions, I just folded the paper in half. Much easier visually on my brain. I love the pale colors of your insert, Martha. I think it is very appropriate and sweet and just perfect for a little one. I think the giraffes are adorable and I love little bubbles on baby boys. My sil didn't want our gs to wear them. Quilt block dress? do tell.....another quilt in the works? Are we having a quilting bee in Indy?